The Traditional X-bracing has forever been part of the internal structure of an Acoustic guitar. there have been subtle changes in the design over the last 2 centuries, incorporating fanned bracing (See PRS’ New SE range), as well as forward-shifted bracing, (Martins Updated, Re-designed standard series) all with the goal of improving the tonal response, sustain and stability of the Acoustic guitar. Though subtly changed, we have never truly seen a radical shift in design – and why would we change a design so close to perfection? 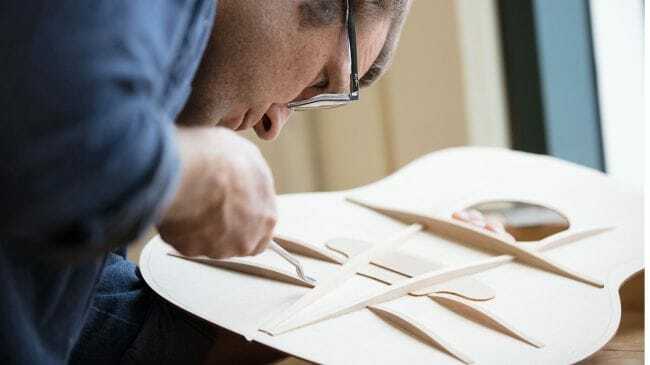 Enter Andy Powers, master Luthier over at Taylor guitars. Bob Taylor and Powers have gained themselves a reputation for going above and beyond traditional acoustic guitar design. bolt on necks, ethical and sustainable wood sourcing, ground-up redesigning of the electronics systems in their whole guitar line, super-thin gloss lacquer, Pioneering a short scale acoustic bass design – the list goes on. Naturally, then, Powers was up to the task to completely re-think the bracing system offered in acoustic guitars to offer something even better than what has gone before. Taylor’s new V-class bracing has been designed to tackle the core bug-bears that we learned to accept on the acoustic guitar – Intonation, Sustain and Harmonic content. With an X-Brace system, an acoustic guitar soundboard vibrates in a rotational fashion – imagine the movement a spinning coin makes before it comes to rest flat again. This design promotes even distribution of vibrations across the guitar, which in turn generates a balanced frequency response throughout the instrument – though it is less controlled and focused due to the sheer space the vibrations disperse across; there is simply a lack of sound energy. The V-bracing offers a different mechanism – Vibrating from left to right across the soundboard. Though a simple re-design, the result is phenomenal. tuning stability across the neck is much more accurate. Sustain feels almost infinite, and harmonic content is so tonally rich and thick, its hard to believe this bracing hasn’t been done before. The V-shaped bracing complements the direction of the grain pattern on the guitar – travelling in tandem from the lower bout to the neck heel, rather than countering it in an X format. 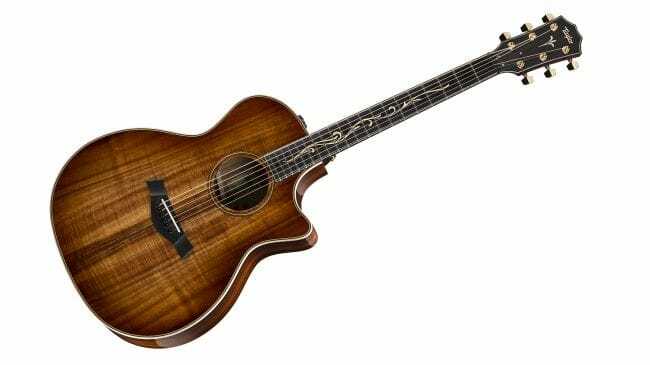 Taylor has introduced this bracing on several models – the PS14ce, The stunning K24ce, the 914ce, and the Builders addition K14ce. Picking any of these models up and experiencing the V-class bracing in an A/B demonstration with an X-braced model reaps the benefits of Power’s redesign instantly. Singing sustain, harmonious tuning, and the tone that Taylor has built their success from in spades. Available only on Grand Auditoriums currently, we no doubt expect this design to be rolled out across the many Taylor body shapes, and to be as revolutionary as their acoustic bolt-on neck design.